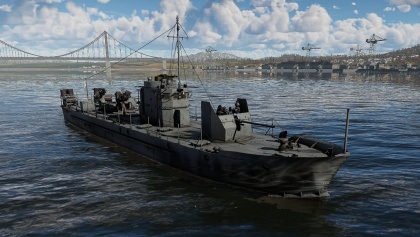 The BMO is a rank I Soviet armoured sub-chaser with a battle rating of 2.0 (AB/RB/SB). It was introduced during Update 1.79 "Project X" when the Soviet fleet was implemented into the game. BMO stands for Russian: бронированный Mалый Охотник, Bronirovannyj Malyj Okhotnik; English: Small Armored Hunter. The mid-section of the hull and the bridge are the most well armoured places on the BMO, with maximum thickness of 12 mm around the bridge. The main 37mm has a 10 mm thick shield protecting it from light enemy fire, whereas the 45 mm can be knocked out very easily, especially by planes. Fires are frequent, but that is due to the nature of early-tier boats, not to any major flaws of the boat. The BMO can reach 43km/h in AB and 37km/h in RB and SB (without Depth Charges). The acceleration is decent, but lighter boats will easily overtake you, so you will rarely reach strategic points first. The BMO can reach reverse speeds of up to -24km/h (AB). It turns very well, retaining its mobility even at lower speeds, that is because its rudder reroutes very quickly, comparable to the lightest of boats, such as the G-5. Overall, the BMO is very mobile, but not very fast. The 37 mm main armament on the BMO is very powerful in the fact that it is rapid fire and can obliterate small boats with its armour piercing belt rounds. However, anything larger than a submarine-chaser won't take much damage from your calibre of fire and it is recommended to steer clear or switch to the larger calibre secondary. The ammo capacity is quite unusually large at 500 per belt, with a capacity of 2 belts. You won't be reloading or running out of ammo quickly. The clip reload is unbelievably fast for how much ammo it has, which makes from changing from HE to AP a breeze. It is hard to overheat the weapon, but just keep in mind not to hold down for too long. This weapon can also double as an AA gun with its rate of fire, and manual aim instead of AI would be better, as the AI can overheat the weapon and don't stop when the weapon is overheated or near overheating. The rotation is not as fast as one would expect, but after upgrades, it is snappy and can easily catch speedy patrol boats off guard. The 45 mm secondary armament on the BMO is slightly more powerful than the primary 37 mm, although it should only be used against the toughest opponents, hence its secondary nature. The rate of fire is slow, so it is advised to use this weapon at longer ranges. However, that also means that you shouldn't worry about ammo running out, and you can keep holding down the fire button, as the weapon doesn't overheat. The anti-air armaments consist of a total of four 12.7 mm machine guns (2 x AN-M2; 2 x DShK). 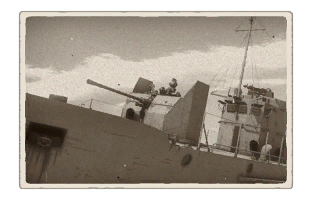 These guns should be primarily against the aircraft, which are relatively easy to take down at BR 2.0, but they can also be used against the light-armoured boats that are still present at this BR (such as the LS 3). The guns are positioned in the middle section of the ship, on top of the bridge and on the stern, which should pose no problems against aircraft, because you will be able to get at least 2 guns onto the enemy, but it can be hard to attack boats directly in front of the ship. The BMO has the option to carry 8 x BB-1 depth charges. They can be used to surprise flanking opponents or to sink tougher enemies by dropping charges in their path. Remember that you can set the Depth Charge activation time before spawning in if you carry Depth Charges. You can select to delay the activation time from 3s to 10s. You should find the optimal activation time for yourself, but it is advised to use something in the middle (5-8s), so that you have a wider range of options when using your depth charges. The BMO is one of the first Russian boats that has a large variety of armament. At this stage, you may need to assign new buttons to be able to select your primary/secondary/anti-aircraft armaments, because the BMO works best when all of its weapons are used. Generally, the BMO should be played like a slower Motor Torpedo Boat that can stand its own ground. For example, at the beginning of match around its own BR (1.7-2.3), it can rush a cap point and decimate the oncoming light boats with its 37 mm primary (which is comfortably positioned in the bow). When the cap is clear, the BMO can take on a defensive role behind some cover. The 45 mm secondary armament should mostly be used in an up-tier (BR 2.7-3.0) against the larger American and German ships (Elco 80ft / S-100), but you still need to be careful, because those ships can easily take out your guns, and the BMO itself. If you're unsure whether it's best to use the 45 mm or the 37 mm, always go with the 37 mm, because it is much more forgiving. As for the playstyle, when you get into battle rating 2.0 or below you can get away with almost everything. Simply use your 37 mm to obliterate any threats coming from the front, and if you're flanked or in a messy fight, switch to your anti-air armaments and continue obliterating everything. The AI gunners can be set to both surface and air threats, but if you are more experienced, you can change them based on the situation (more planes - focus on air threats; in a messy fight - focus on surface threats). Now, if you get into battle rating 2.3-3.0, you need to play safer. Don't rush for caps alone, because ships of higher battle ratings can easily sink you. You should flank your enemies where possible and unload your 37 mm (or even the 45 mm) into the exposed sides. The anti-air weaponry will be mostly useless against ships at this BR, so you can just set your AI gunners to air threats and focus on the ships. Your greatest enemy in this BR is large sub chasers (110 ft Nasty) and other BMOs. When facing these, take out the primary armaments with your 37mm, as this is the effective, more than forgiving weapon to do so and then start shooting the ammo racks or critical modules and try to have a teammate with larger guns than you (a Soviet armoured gunboat is a perfect companion to pair up with as both have very similar speeds) to take the compartments, as you don't have the time to take on all compartments with such a small calibre gun. It is recommended to load AP clips, as these are very suitable for turret busting.